Food projects are the best – not recipes, but treats. Treats, Halloween, Christmas or even V-Day – they all involve food and this is where I share those projects inspired by food. 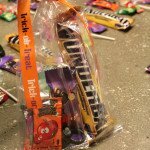 I’m talking trick-or-treating loot bags and holiday candy that’ll make you sick if you eat too much. Let’s get started on these fun and foodie projects. Click the photos below to see the post in more detail. One of my favourite projects below is the mason jar cookies. They are easy to make and taste so good. Both of those reasons make them the best gift around the holidays or even for your neighbour who perhaps watched your house while you were on vacation. Saying thank you for those little things is pretty important in life and nothing (well, in my opinion) says thank you like food. A lot of the items below are Halloween Treat Bags – the goblins on my block have a far way to travel between houses. I do live in the country, after all. So, I like to make it worth their while. Sometimes we’re not home at Halloween and we just leave the treat-bags out. We’ve yet to run out and I’m sure the kiddos take more than one. Happy treating. Check out the photos below and thanks for visiting!